I have a soft corner for Burma and its people. And this love stems from my love and adoration for Aung San Suu Kyi. I have been following the Burmese freedom fighter ever since I got to know of her in school as my father was and is an ardent supporter of Burma. And my insistence on referring to the place as “Burma” and not “Myanmar”, which is a new name given by the military junta, is my way of showing my abhorrence for the military rule and my support for Suu Kyi and all that she stands for. I was introduced to Burmese food and culture quite early in life. One reason was my home state’s (Manipur) proximity with Burma with which it shares a long porous border. There are traders who would go in the morning to the border town near Burma and come back with baskets of goodies which flood the local market. As a kid I must have literally survived on Burmese snacks and tidbits. I remember having roasted sunflower seeds that came in small packets. Many a time our afternoon snack at home was Burmese noodles which we called chau. 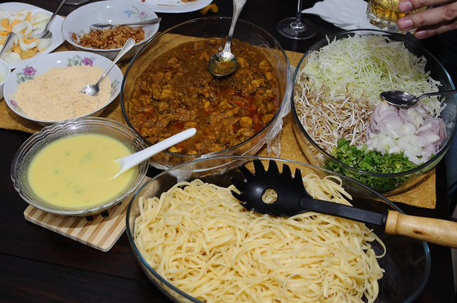 My first khao suey was at a guest house in Tamu, a border town in Manipur. When Kitchen, a café, opened in Khan Market, I rushed to savour the khao suey. When my school friend Johnson Singh recently celebrated his 12th wedding anniversary, I made it a point to be there as I knew he would rustle up his version of a lavish khao suey preparation. Sure enough, he had the most delectable khao suey that I have ever had. It was better than what most restaurants claim to serve. So, I never miss any opportunity to savour Burmese fare. When I was in New York recently and my school friend Rashmi, who played my guide, gave me a list of options on where to dine, I opted for a Burmese restaurant for obvious reasons. First of all, I had no idea about a Burmese eatery in the city which is home to a sea of restaurants serving cuisines from different parts of the world. We settled for Café Mingala, a nondescript no-fuss eatery. We drove past many swanky Italian, Japanese, Chinese, Moroccan and Mexican restaurants and came to Second Avenue between 72 nd and 73 rd. I would say Café Mingala has the most unassuming exterior as compared to that of its neighbours, but the food is something to die for. When we finally settled in I wasn’t immediately or in any way transported to Burma but hit by the fact that this place echoes of nostalgia. How could anyone ever miss the paintings on the wall that depicted different landmarks of the place that is today shouting for attention and freedom? On the wall was a watercolour of the Pagan Kingdom (as burma was known from 840-1287 AD), another wall had a beautiful Inle Lake in a wooden frame. Another had the golden Pagoda and a lively scene of Shweinbin village. The diners in the restaurant are mostly home-sick Burmese looking for some familiar aroma to connect to their home. I overheard them talking about home and new jobs and how this place is like home to them. For 14 years this restaurant has been catering to all and sundry in New York with its simple but flavourful home-style food. And that, according to Jeffrey Hunter, the gentleman who served us, is the USP of the place. By the way, if you go by the name Hunter, you will agree that there is nothing Burmese about it but it’s just that he has adopted a new name ever since he came here decades ago, but he is still a hard-core Burmese. The food instantly takes you to Burma and you will forget you are in New York. My first bite of rice and chicken with potato curry took me back to Tamu, the first border town in Burma, which I visited with my younger brother after my 10th board examination. Potato is like a thickening ingredient that you will find in most dishes. The pork curry with potato or the Mo-Goke Pork which is a juicy roasted pork loin in delicious brown sauce, were all prepared home-style. It means, in less oil and with just the right quantity of spices. Hunter kept telling us this was a very special dish from Mogoke, a seven-hour drive north of Rangoon which is famous for rubies and sapphires. Some dishes on the menu were, of course, made more for locals here. For instance, lobster in basil sauce has nothing so Burmese about it. The very aroma of the Rangoon Night Market Noodles made me recall my first noodle in Moreh town. Needless to say, the khao suey was a delight. It transported me back to another incident in Rangoon which I visited years ago in my futile attempt to meet Suu Kyi. I checked in at Dusit Inya Lake Resort, which was the closest to Suu Kyi’s lake side residence on University Avenue. One early morning, I hired a cab and requested the driver to take me as close to her home as possible. A request he never fulfilled for fear of the many watchful junta eyes. Sadly, I had a quick glace from a distance and had to be content with the sight of a dilapidated house. I hurried back to a local market only to drown my sorry in a plateful of khao suey. I was also reminded of the very khao suey I shared with some Burmese refugees in their shelter home at Krishna Menon Marg in New Delhi. I remember being invited by them and sitting on the floor and relishing their food and washing it down with black tea over many discussions on their freedom movements. In the eyes of these young diners in New York, I could see their longing for home. In the eyes of Hunter, who served us with passion, I see a yearning for home. Food connects you and binds you. An aroma is strong enough to take you back in time and place.